Endodontics is concerned with the nerves and roots of the teeth. All dentists are trained on how to diagnose and treat tooth problems involving the nerve (or pulp) but specialized endodontic procedures need to be treated by an endodontist. When you suffer from a toothache, it can be difficult to pinpoint its source because the complex network of nerves that could cause pain. Sometimes the pain originating from a damaged tooth can be felt in other areas of the mouth. An endodontist is specially trained to eliminate this type of pain, pinpoint its origins and treat it. A root canal is performed when your tooth is infected or suffers traumatic impact. A second endodontic treatment, known as retreatment, can be carried out if pain and infection persists following a first root canal treatment. Retreatments can either be surgical, through a process known as an apicoectomy, or non-surgical. The method used will depend on the dentist’s diagnosis. Find microscopic fractures that could not be detected in x-rays during your past treatments. Your tooth could chip, dislodge or get knocked out in an accident or during a high-impact sport. Though dislodged teeth are rare, when they happen, they are very severe. Such injuries need to be examined and treated by an endodontist who’s highly specialized dentist at treating trauma-related dental damage. Treatment for fractured teeth: If the crown of your tooth is chipped, it can be repaired by reattaching the piece that’s broken or using a tooth-colored filling. If a large part of your tooth is broken, your tooth will be restored using a dental crown. 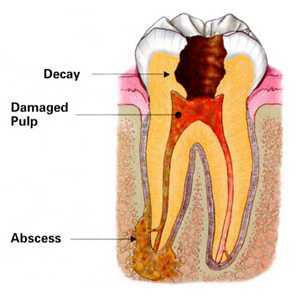 When an injury leaves the pulp exposed, you’ll need a root canal procedure. A split tooth might require extraction. After it’s extracted, you’ll need an implant or a partial denture. Treatment for dislodged (luxated) teeth: A tooth could get dislodged by being pushed sideways, into or out of its socket. An endodontist will repair this damage by repositioning and stabilizing the tooth. A root canal procedure will need to be performed and you’ll also need medication. Knocked-Out (Avulsed) Teeth: If your tooth gets knocked out, it can be restored as long as you keep it clean and avoid touching the roots. The endodontist will put the tooth back in the socket and stabilize it with a splint. A root canal will have to be performed after it’s stabilized for a few weeks. The amount of time that the tooth was outside your mouth and how you stored it will directly influence the results. Root Fractures: The position of a root fracture will determine whether a tooth can be saved or not. If the fracture happens close to the apex, it will likely be saved. However, if the fracture is close to the gum line, there’s a lower likelihood of success. The tooth might require to be stabilized using a splint for some time. Seeking treatment immediately is important, particularly for a dislodged tooth, in order to avoid root resorption. Resorption happens when defense mechanisms kick in, leading to rejection of your tooth. For at least 5 years, you should see your dentist regularly to minimize chances of resorption.